First of all let’s start with a comparison of the most sold commercial slush machines. 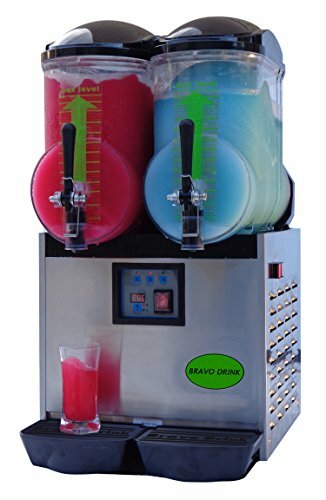 This are the commercial slush machines with a good rating and good reviews. When there are new ones on the market I will add them to the best commercial slush machine list. 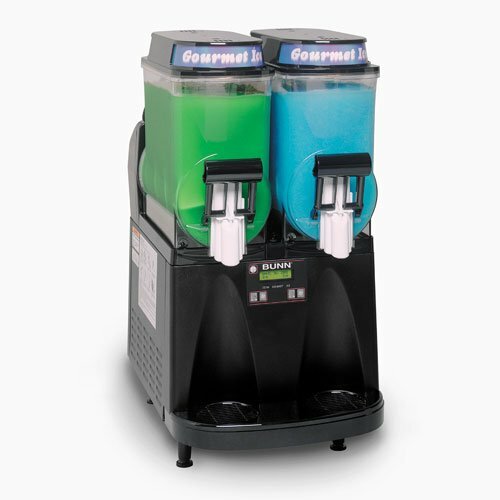 Click here for an overview of all commercial slush machines. 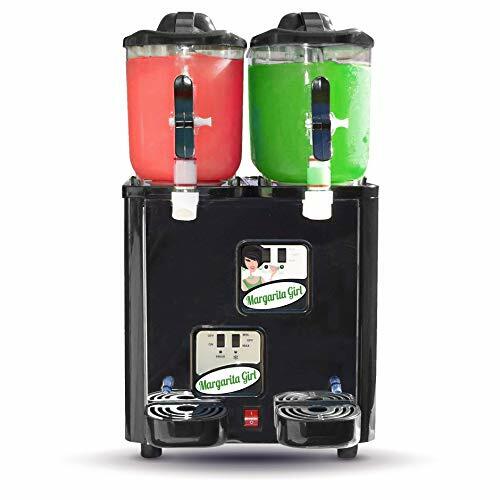 Or check out this list to read about the more sold commercial margarita machines below and compare summaries of user reports with the main pros and cons of those according to customers. You can see more features by clicking on it. 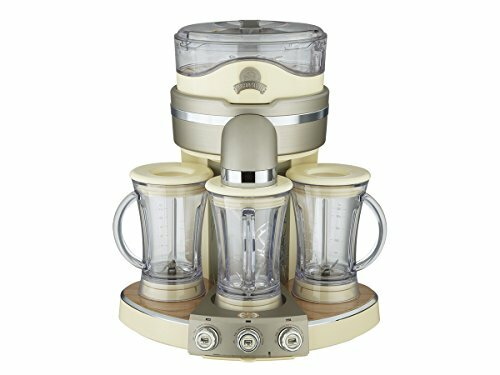 Are you looking to buy the best commercial margarita machine? Check out the reviews of the these slush machines first and save up on your purchase with a slush machine sale! As the price is not that much more then the mini sized margarita girl I prefer this one to the mini margarita girl (see below). Especially as it has 2 bowls of 12 liter compared to the 2 bowls of 6 liter of the mini. It has an eye catching lighted top, handy for attracting attention. Freezing the slush takes about 1 and a half hour, depending on the starting temperature off course. Connecting liquid holder and freezing part after cleaning needs a lot of force. The thickness of your slushie is digital adjustable per bowl. This comes in handy if you want two different drinks. Cleaning is relatively simple and does not take a whole lot of time. The Bunn does not have automatic refill options. You will have to make the mix manual and add it to the bowl. The machine makes noise when it freezes for a couple of minutes and is quiet for a couple of minutes, then starting over again. You can speak over the noise but it is annoying when in the same room. Heavy! It is heavy so if you plan on moving it a lot this is something to think about. Here is the Margarita Girl Double-Bowl Mini Size Slush Machine. And there is off course it’s little sister the Single-Bowl Mini Size Slush Machine. These two are often bought slush machines for commercial usage. I personally think that the single does not give a good enough choice for customers but perhaps in real small settings it will do. You can have a look at the Margaritaville Tahiti though. The dimensions of the Double-Bowl machine are 13.3 x 12.3 x 24 inch and the dimensions of the Single-Bowl are 10 x 12.3 x 20 inch. This machine has a total capacity of 12 liters (about 50 cups) divided over two 6-liter bowls. The margarita girl mini quickly freezes and it is easy to clean. This commercial slush maker has a quite powerful compressor but as a consequence it is also quite loud! An other good option could be the Margaritaville Tahiti Frozen Concoction Maker. If you are hesitating if you need a full blown commercial slush machine this a good way to test it out. The quality is good enough for commercial usage and the quantity is not that low so for a small shop owner it will do. That combined with the cheap price compared to the other models makes this one a good choice. The dimensions of the DM3000 are 20.1 x 20 x 20.1 inch. Serves 3 different type of drinks at the same time. The price is very doable compared to the other slush machines. Most parts are easily available. Though it is a good quality this is not a commercial grade slush machine. Bring the Beach Party Home! You are the Bartender Making Everyone's Favorite Frozen Drinks! 100 CUPS of Delicious Frozen Beverage . The Bravo Italia 2 Bowl Slush Machine is a smaller machine with it’s 2 x 1.3 Gallon bowls but there seem to be happy users. if you have a smaller shop this size will do. There are no reviews for the 2 bowl sized one but there are a few for the one bowl Bravo Italia, so check out the ratings there. Slush machines in plain sight help to increase income. On hot summer days people love to see the cold drinks in the cans moving around, with nice drops of water to show of the coolness of the drinks. If you have a family and kids centered place the frozen smoothies and slushees are real attention drawing machines to most kids and with them their parents. If you run a business for a more adult public you can fill them with alcohol based slush and cocktails (commercial daiquiri machines) or with frozen coffee based mochas and cappuccinos. 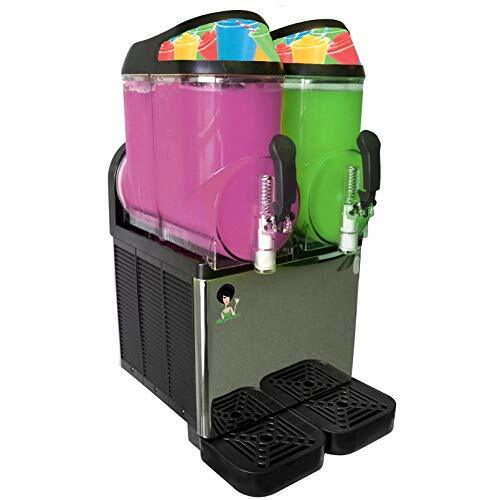 Most commercial grade slushy machines can be used for both, the more kid version or the adult version. There are three types of commercial slushie makers, based on how you make the drinks. Pourover slushy makers, liquid auto fill slush machines and powdered auto fill slush machines. Pourover slushy machine: With this machine type you will have to mix the drinks manually and then pour them in the machine. Liquid auto fill slushy maker: With the liquid auto fill the drinks mix will be drawn from a supply out of a box. Powdered auto fill slushie maker: The powdered auto fill uses a powder in the machine which it then mixes with water drawn from outside the machine. Every one has its own cons and pros. There are slushie makers with a single bowl, double bowls and triple bowls. Depending on how many slush you plan to serve and wether you want people to have a choice you can pick one. To make choosing simpler: if you use 12 oz servings 1 gallon will give you about 10 servings per hour. As with all food and drink machines it is important to keep your equipment good. This means regularly cleaning to prevent bacteria from getting a grip on your machinery or bowls. Everyday a quick clean and once a week a thorough cleaning should do the trick. (unless you use diary products, then you will have to clean it every day) Daily cleaning is the faucet and drip tray. Deep cleaning means the moving parts and the tank. This will in the end determine if our machine is profitable or not. It can be very rewarding. On average the costs differs depending on the mixes you use. Clearly coffee will be more expensive then lemonade. You can choose to buy syrups between jug mixes or bag in box mixes. The last is the cheapest if you sell a lot of slushes. Syrup costs will be around the 10-15 cents a cup and next to that you will need a cup or a glass and a straw.